View of the leafy landscaped gardens surrounding Kensington Palace. The palace was built for William III and Mary during the 1690s as an alternative to the old royal palace of Whitehall. It was worked on by Wren and Hawksmoor. 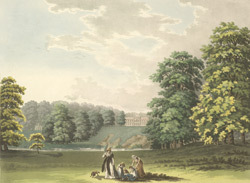 The gardens were an important part of the overall image projected by the palace, as William was a keen landscape gardener. His formal gardens were removed by later monarchs and several new features added such as ornamental ponds, a Broad Walk and a temple.